Suggests that most altruism can actually be harmful due to lack of information, bad data, and prejudice, and instead argues for focusing on evidence and reasoning when considering altruisic actions. An up-and-coming visionary in the world of philanthropy and a cofounder of the effective altruism movement explains why most of our ideas about how to make a difference are wrong and presents a counterintuitive way for each of us to do the most good possible. While a researcher at Oxford, William MacAskill decided to devote his study to a simple question: How can we do good better? MacAskill realized that, while most of us want to make a difference, we often decide how to do so based on assumptions and emotions rather than facts. As a result, our good intentions often lead to ineffective, sometimes downright harmful, outcomes. As an antidote, MacAskill and his colleagues developed effective altruism—a practical, data-driven approach to doing good that allows us to make a tremendous difference regardless of our resources. Effective altruists operate by asking certain key questions that force them to think differently, set aside biases, and use evidence and careful reasoning rather than act on impulse. 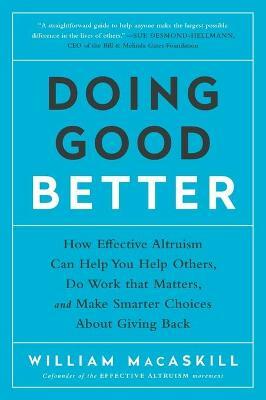 InDoing Good Better, MacAskill lays out these principles and shows that, when we use them correctly—when we apply the head and the heart to each of our altruistic endeavors—each of us has the power to do an astonishing amount of good. One You Are the 1 Percent: Just how much can you achieve? Two Hard Trade-offs: Question #1: How many people benefit, and by how much? Three How You Can Save Hundreds of Lives: Question #2: is this the most effective thing you can do? Four Why You Shouldn't Donate to Disaster Relief: Question #3: is this area neglected? Five The Best Person Who Ever Lived is an Unknown Ukrainian Man: Question #4: What would have happened otherwise? Six Why Voting is Like Donating Thousands of Dollars to Charity: Question #5: What are the chances of success, and how good would success be? Seven Overhead Costs, CEO Pay, and Other Confusions: Which charities make the most difference? Eight The Moral Case for Sweatshop Goods: How can consumers make the most difference? Nine Don't "Follow Your Passion": Which careers make the most difference? Ten Poverty Versus Climate Change Versus...: Which causes are most important?